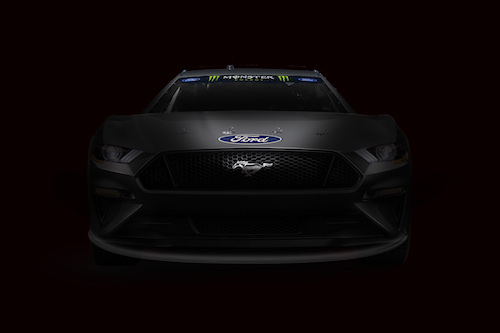 Ford Performance announced Tuesday morning that the new Ford entry for 2019 Monster Energy NASCAR Cup Series competition will be the Mustang. Six series race teams, accounting for 13 full-time entries, are fielding Fords in NASCAR’s top series this year — Wood Brothers Racing (1), Roush Fenway Racing (2), Team Penske (3), Stewart-Haas Racing (4), Front Row Motorsports (2) and Go FAS Racing (1). Ford already fields Mustangs in the NASCAR Xfinity Series but will continue with the Fusion through the 2018 season. The other two manufacturers in the Cup Series, Chevrolet and Toyota, introduced new cars in the last two race seasons, with Toyota rolling out a newly-designed Camry ahead of the 2017 season and Chevrolet moving from its SS to the Camaro ZL1 ahead of the 2018 NASCAR season. The Mustang that’ll hit the track in 2019 will be the fourth Ford model in NASCAR premier-series competition, following the Thunderbird, Taurus and Fusion. The manufacturer’s prospective 2019 entry is expected to be submitted formally for NASCAR approval this summer. “This announcement makes me happy,” Ford Motor Company board of directors member Edsel B. Ford II said. “Mustang is a car that is woven into the fabric of our country, and it’s only right that we put it on the track in NASCAR’s most visible series. I can’t wait.